It’s been a long time since I’ve written up reviews on anything from my book pile. Here’s an overdue catch up post with short reviews of several books I’ve read over the last six months or so. Growing Object-Oriented Software, Guided By Tests by Steve Freeman and Nat Price. Pub Addison-Wesley, ISBN 0321503627. The first part of this book seemed scattered, jumping all over the place and making a lot of reference to things which weren’t defined until later in the book. However, once you get used to the style, this book jumps off a cliff and hits a lot of great topics, and hits them in depth. Tooling, design, culture, methodologies – it’s all covered, and it’s covered fairly well. I particularly enjoyed the authors carrying the same detailed, practical example through the book. Too many software books use trivial examples specific to one topic. Freeman and Price evolve an “Auction Sniper” as they go through the book; the consistency is a great asset. I also enjoyed the authors speaking emphatically about using acceptance tests as the starting point for features, not just unit tests. There’s an important differentiation between acceptance and unit tests, and the authors specifically call out acceptance tests “using only terminology from the application’s domain” – speaking to the feature’s business driver, not the underlying technology. Also as critical to me is the authors’ emphasis on keeping the test side of the codebase clean. Your tests ARE production code. Treat them with the same approach about solid design and refactoring as you treat the code you’re deploying to your customers. This isn’t a simple 100-level book. The authors dive deep in to design, practices, and lifecycle. They do it well enough that they’ll hook newcomers to testing as well as teach accomplished folks new things too. Cooking for Geeks by Jeff Potter. Pub by O’Reilly, ISBN 0596805888. OK, this book is just plain fun. The recipes are straight-forward and tasty, and it’s terrific to dive deep in to how and why food transforms itself during the cooking process. Potter covers everything from Calibrating Your Instruments to creating your own sous vide immersion cooker. Along the way you’ll learn about how leaveners work, discover a new taste factor you may not have known of (Umami), figure out some key time/temperature figures critical to food safety, and get exposed to some interesting molecular gastronomy. The writing style is exceedingly well-done. Potter does a great job walking readers through the recipes and the science behind them – and it’s extremely apparent that he’s writing about something he loves. I’m a very serious, very accomplished home cook and I got a tremendous amount out of this book. More importantly, I had scads of fun reading it. Apprenticeship Patterns by Dave H. Hoover and Adewale Oshineye. Pub by O’Reilly, ISBN 0596518382. Short, concise, well-written, highly useful. Other books such as Chad Fowler’s The Passionate Programmer cover similar things, but this book sits absolutely well in that company. This book is a series of very short articles (“patterns”) around specific things you can do to guide and improve your career as a software craftsman. The articles all follow the same template: discuss the context of an environment/situation you’re in, lay out a problem you need to solve, then offer up a solution for you to apply to that problem. Many of the articles are interwoven, linking common ideas or useful concepts. This book echoes a number of things in Passionate Programmer like the concepts of being the worst in your group (work with folks that are a LOT better than you so you’ll learn more), but it’s a very worthwhile read on its own. Apprenticeship Patterns is particularly nicely done in that the authors don’t push a specific path they expect you to follow. They lay out a number of options and encourage you to find the path that works best for you. I also GREATLY appreciated the authors being pragmatic over dogmatic in their approach to software craftsmanship. Certain zealots in the craftsmanship movement have completely lost site of the primary purpose of our trade: delivering value to customers. In their section “Craft over Art” he authors specifically and emphatically point out that we need to deliver “value to customers over advancing your own self-interests.” They don’t promote getting sloppy with one’s work, but emphasize doing your work well while keeping the folks in mind who are writing the checks. All in all, this is a solid read. Solution: If you have access to HyperV, load the image in HyperV and use VMWare’s stand alone converter. It’s awesome. Point it at your HyperV server, select the server, and the converter does the rest. If you don’t have access to HyperV, all is not lost. Now you can create a new VMWare image and use the existing VMDK. The VMDK’s format is from an older version of VMWare, but VMWare will nicely upgrade it for you. Power on your VM and bask in your geeky awesomeness. Then go pay for WinImage because they’ve saved your bacon and you should throw some money their way. That’s how shareware works, folks. Problem: In VMWare 6.x and 7.x I constantly run in to the problem where I set the VM to full screen mode and then have the cursor in the VM go completely bonkers – clicking anywhere in the VM causes the cursor to shoot to the upper left corner. Occasionally a number of items on the screen will get selected. Solution (sort of): Toggle the VM to multiple-monitor mode, minimize VMWare, maximize it again, and finally switch back to single-monitor mode. It’s ugly, but it works. Problem: You get the infamous, unhelpful error message screen in SharePoint 2010 (“Click here to troubleshoot problems with SharePoint Foundation”) when trying to access Site Actions | Site Settings | Manage site features (or Site collection features). Error logs show entries from the w3wp.exe process, usually entries such as “System.IO.IOException: The file or directory is corrupted and unreadable” followed by other exceptions with “...Context.RunAsProcess(CodeToRunElevated secureCode)” as their entry. Solution: I checked the app pool for my SharePoint web app and found it was running with Network Service. For whatever reason, that account wasn’t given read access to SharePoint’s 14 hive (C:\Program Files\Common Files\Microsoft Shared\Web Server Extensions\14) during installation or site collection creation. It’s hacky, and I’ve not done a lot of validation, but simply granting Network Service read/write/modify privs to this folder solved my problem. IMPORANT NOTE: This was on a dev box. I’ll dig deeper before doing the same on a production system. You should too! CodeMash 2011 is in the can and I’m mostly recovered after a weekend at the Kalahari and several naps yesterday. Behind the scenes we organizers had a number of issues that gave us a load of last-minute grief, but hopefully we did a good enough job that most of those issues never leaked out in to public. One of the big things we’ll refactor for next year is our approach to keynoters. Every year in the previous conferences we’ve had the same basic setup: 20 – 30 minutes for attendees to get their food prior to the keynoter kicking off their talk. This let us hold meal periods to 90 minutes, enabling us to not lose an additional breakout session right after keynoters. This also enabled us to get three great keynoters each conference, something I don’t think any other conference around does. This arrangement has worked extremely well in the past; however, this year attendees made it clear by their Tweets and especially their behavior during the keynotes that they wanted a better separation of meals and keynotes. As a result next year we’ll likely drop down to one single keynote following a longer meal period. We’ll lose one additional breakout timeslot, but it will give everyone more time to deal with the logistics of getting though the food lines. I’m personally saddened by the loss of the two additional keynoter slots, but we need to follow what our attendees are pushing for. Note on the food lines: Unfortunately, we had two meals that were quite honestly train wrecks regarding long lines at the buffets. I’ll personally take the hits on these due to some miscommunications with the venue’s catering folks regarding timing. This is the first time in five conferences we’ve ever had this problem. I covered the issues with the Kalahari’s awesome staff during the post-conference wrap up with them. Please trust me: the problem of grossly backed up buffet lines will never happen again. Ever. Note on the Thursday lunch “keynote”: It wasn’t a keynote. This was specifically a special launch event. We thought it was a wonderful opportunity to have something of a global impact showcased at CodeMash. We’d be happy to consider other vendors approaching us for future events of a similar nature. We’ll also work harder to ensure everyone understands the differentiation between launches and keynotes. We’re also going to consider refactoring the notion of allowing family members to eat with the attendees. As was very obvious, CodeMash has been extremely limited in venue space the last couple years – the dining hall is completely full with attendees, so there’s no physical space for family members or guests to eat meals alongside the attendees. Previously it’s also been a nightmare to deal with the separate billing required to cover food costs.Thankfully two things have happened that remove a couple significant roadblocks. First, our move to Eventbrite for ticketing has GREATLY reduced the headaches associated with our registration system. We should be able to handle the mechanics around separate meal-only tickets now. Secondly, the Kalahari is adding on new construction that jumps their conference space from the current 18,000 square feet to well over 120,000 square feet. As a result, we’ll have physical space to seat a lot more folks. We won’t turn CodeMash in to a huge 5,000 attendee conference, but we certainly should have the space for attendees and guests to chow down together. To be clear: Guests during mealtimes isn’t a done deal, but we’re certainly going to have a hard look at it. OK, so on to a few things I consider highlights of CodeMash 2011 – and I have a much different view of things I personally find successful than most other attendees. The Wednesday night band. There’s an amazing story behind The Womack Family Band and Chris Castle showing up, but I’ll leave that for another post or you can ask me in person. Chalk it up to the amazing great karma CodeMash seems to have picked up over the years. Open spaces. This year’s open spaces were, to me, the most successful yet. We’ve had more sessions on the board in previous years, but this year the conversations in the Grand Hall were all intense, highly engaged, passionate discussions. It was just awesome to see those going on. My Wednesday at midnight (appropriately) dive in to “Are You A Werewolf?” I was physically wiped out and emotionally drained after a long, stressful day when Steve Smith and others in one of the game rooms hollered at me to join the game. That 45 minutes of fun got my head back on right and gave me the kick to roll through the rest of the conference. Many thanks, folks! KidzMash. Another “Wow.” Melissa Insko took off with this and added on a whole second day of activities. Lots of great stuff going on there, and I’m so happy she and Darrell Hawley did such an amazing job lining up fun things for the kids and families. The attendees. CodeMash is great because we get great speakers to show up and deliver great content, but CodeMash is awesome because we have an amazing crowd of attendees who show up excited about learning and ready to get engaged with new ideas and people they’d otherwise never reach out to. Thanks to all of you! On a closing note, I have to thank the amazing crew who puts on CodeMash. A large number of newcomers to CodeMash don’t understand that the conference is organized and executed completely by volunteers – and a tiny crew of them at that. I’ve heard of similarly-sized events having volunteer staff of 30 – 100 staffers. We do CodeMash every year with SEVEN, plus a couple on-site helpers. 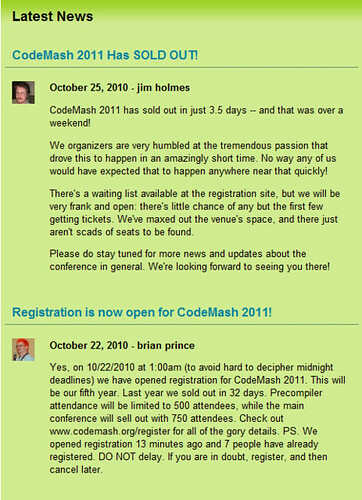 CodeMash 2011 is Nearly Here! Thanks to Joe Fiorini, I have an awesome countdown tool that helps me know exactly how close CodeMash 2011 is! It’s been an amazing run putting CodeMash together this year. We’ve had an amazing turnout from sponsors (we sold out of physical spots! ), the best sessions from the best speakers of any CodeMash so far, an amazing lineup of PreCompiler workshops, and of course we are still a bit shell shocked that we sold out in 3.5 days. The screenshot of the CodeMash newsfeed says it all: registration open, registration closed. Absorbing all the tremendous positive energy exuded from all the attendees – it’s this energy that recharges me and keeps me rolling for another year! I hope to see you there! If not, hopefully at the 2012 event!